When I was 7 years old, I was obsessed with the movie 101 Dalmatians. I knew every trivial fact about that movie. For my birthday, my mother took me to the Disney Store and I bought every 101 Dalmatians trinket, stuffed animal I found. I arranged them in my room excessively precisely, with the assistance of a touch of OCD. Around the age of 21, I became a beer connoisseur as both a hobby and professionally (on my 21st birthday, the beer bar I had been working at for years promoted me to beer and bar manager). I tried every variety of beer I could. I started brewing beer and even bought myself a kegerator that could hold a 5 gallon tank in which I would age what soon would be ale. For every tank of beer I brewed, I spent hours crafting a one-of-a-kind tap handle. I collected beer mugs and steins. I was obsessed. And now, here we are seven years later, and my current obsession is yoga and everything associated with it. I consider myself a yoga mat connoisseur. I am lucky -- I get to do yoga (instead of eat) on my lunchbreak 2-3 times a week. During these classes, I bring a new mat from the giant collection of mats that we sell (and a few that we don’t) on Yoga Accessories. I have tried more yoga mats than rudraksha beads on a Hindu prayer garland. That’s a lot of mats. I don’t know what I am trying to accomplish, but with this blog entry, I want to share information with our customers who aren’t lucky enough to try before you buy. And depending on product descriptions alone is dubious at best (even though I write those, too). For hatha, restorative, yin, nidra, and other classes slower-paced than hatha, a quarter inch PVC mat (the ones most studios carry for their students to borrow) is adequate for most yogis. However, if you sweat more than most or are into hot yoga, vinyasa, power yoga, ashtanga … any rigorous form of yoga, you will need a mat that will further assist your practice. As you know, there is nothing worse than having to grab the sides of a slippery yoga mat in a three-minute down dog ten minutes into class, and in every down dog thereafter. 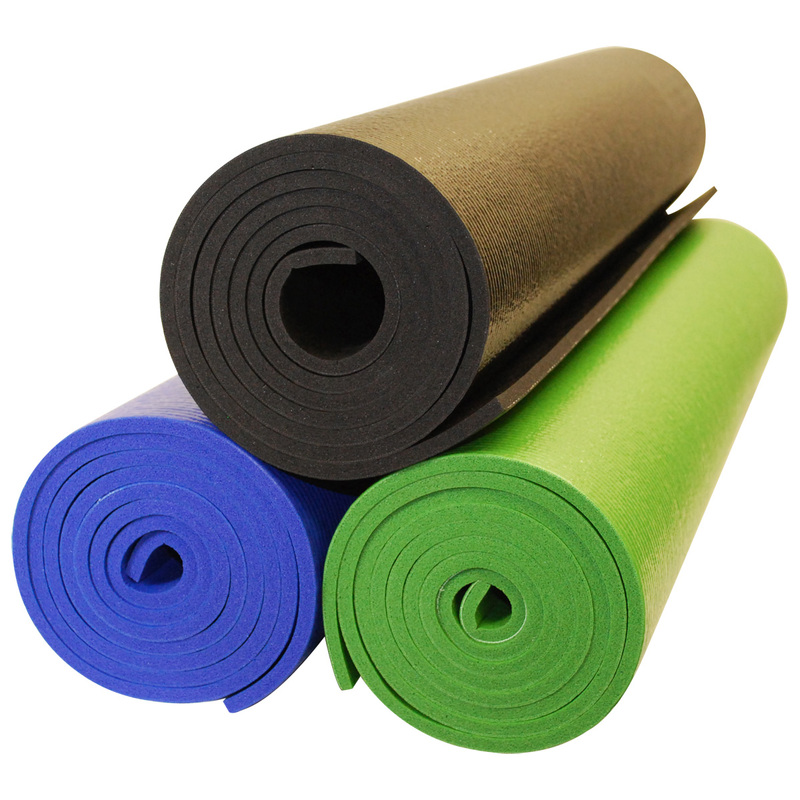 Beginner and intermediate yogis might need a specialty nonslip mat like the ones listed below until they gain enough core strength to handle any yoga mat -- even the ones people think are slippery. Nine times out of ten, it is the moisture of perspiration that affects how slippery your hands are on the mat and not vice/versa. It's not the mat's fault. Good yoga mat towels, like Yogitoes, work … but they are $54-$76, and you can buy a new mat from this list for less than that. Here is my list of my absolute favorite yoga mats. They also happen to be relatively inexpensive, and by “relatively”, I mean compared to the likes of Manduka and Lulu who charge over $100 for a yoga mat not half as good as the ones on this list. I say that as a yogi and not as a writer for Yoga Accessories. With these mats, you won’t need a mat towel. You won’t need to fold the mat over to protect your joints. You will have more time to focus on your intention, your asana, and of course, your breath. 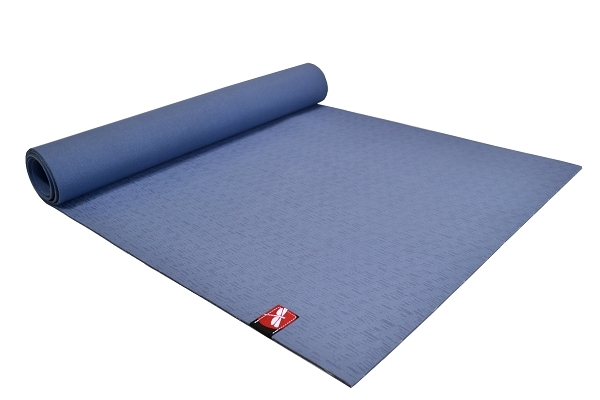 YogaAccessories Premium Weight Yoga Mat : This is the best mat for the lowest price on my list. 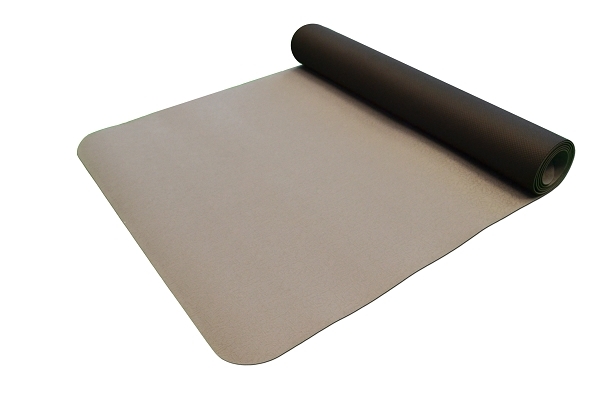 You can’t beat forty bucks for a slip-free and rigid performance mat. 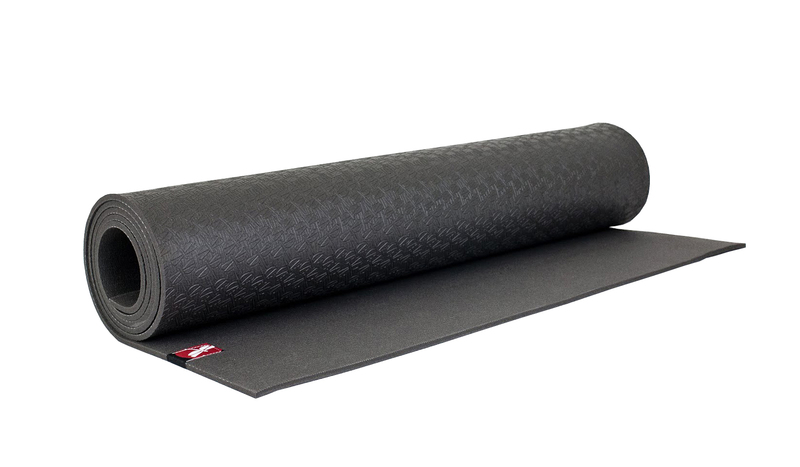 This is basically the Yoga Accessories’ generic answer to the Manduka Black Mat and the Dragonfly Performance Pro Mat, but the Premium Weight Yoga Mat has a texture-free slick bottom (similar to Lululemon mats) and a grippy, textured top (instead of the thin, skidless fabric-like layer on the top like Dragonfly and Manduka). Dragonfly Performance Pro Mat : This is my favorite and my go-to yoga mat. Right now, it is in my trunk, safely protected by both mild weather and my large red Yoga Accessories Cotton Zippered Yoga Mat Bag. Here’s why I am in love: a textured and repetitious Dragonfly pattern adorns the entire bottom of the mat -- the logo of up and coming purveyor of performance-minded yoga gear. The top layer is covered in a super grippy fabric-like textured material which wicks sweat from the closed-cell composition. The mat is heavy and rigid, so it’s great on uneven surfaces like grass, carpet, and more. It’s very effective at keeping sweaty hands and feet grounded into the earth. Effective and versatile: these are the two words I would use to describe this mat. Dragonfly Natural Lite Rubber Mat : This is the grippiest mat I have ever used -- ever. It weighs almost nothing. It is foldable and great for travelling. The only problem here is that it is 3 mm thick, so unless you are practicing on a short-hair carpet or other yoga mat, this mat can be hard on joints. Because I love this mat so much, my simple solution is to put it over the 1/8 inch mat generously provided by the studio I attend. It works perfectly. If you buy this mat, you will not regret is. 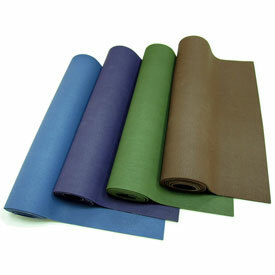 Yoga Accessories Eco Yoga Mat : The name of this yoga mat does it little justice. Basically, if I was to engineer and design my idea of the “optimal yoga mat”, this is what I would come up with. Let me list the list of pro’s in less than 1,000 words: The top is made from a thin layer of closed-cell/sticky, grippy, natural rubber like the Dragonfly Natural Lite Rubber Mat (above). The bottom layer is made from TPE which is not only uber lightweight, it is also an eco-friendly plastic alternative. The TPE is textured so it won’t slide on studio surfaces. To say the top layer is ‘subtly aesthetically-pleasing’ is the understatement of the century. I just think, personally, this is the coolest pattern: a grey-on-grey repeating pattern of a geometric rose. The rose is not girly or realistic, but instead made from geometric triangles and other shapes. Geometry like this is known to have metaphysical healing powers -- no kidding! 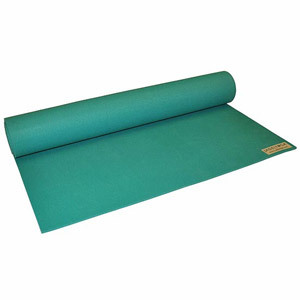 Teal Professional 74" by Jade Yoga : Jade mats are made from natural tree rubber but do not smell. They are not *entirely* made from rubber, there are other “natural and man-made components” are the secret ingredient that sets these mats apart from competitors. Unlike most rubber mats, Jade mats are open-cell, absorbing sweat off the body. Jade mats are so sticky, your foot might get caught when you jump through to the top of the mat to meet the hands in sun salutation. And then there’s this: for every Jade mat sold, Jade Yoga plants a tree through non-profit Trees for the Future. How’s that for an incentive? YogaAccessories Natural Rubber Yoga Mat : in “woodgrain brown”. You MUST get this mat in “woodgrain brown”. It has rounded edges which help the mat stay flat on the floor, and an awesome brown-on-brown light brown textured woodgrain pattern on top (the textured pattern increases the immense stickiness; the bottom is brown with a rubbery and textured feel, locking this mat into the floor). I can easily say that this mat is like a thicker version of the Dragonfly Natural Lite Rubber Mat. Five stars for appearance, and customer reviews rave about the perfect level of “density, grip, and style.” Did we mention it’s eco-free? These gorgeous mats are made from natural tree rubber, but free from that horrible rubber smell.This mat is truly a diamond in the rough, and because it went unnoticed for a while, it has been discontinued. We have a couple hundred of the brown Natural Rubber Yoga Mats left, so grab one while you still can! What’s your favorite yoga mat? Let us know which mats you love, and also which mats you don’t love so much, we’d love nothing more than to hear about it in our comments section.